ZOMM specialises in a range of multi-functional Wireless Leash devices for women which act as personal alarms, Bluetooth key finders, CHILDREN finders and hands-free devices. Wow, that’s one multi-talented gadget. The Wireless Leashes are about the size of a £2 coin and clip onto any keyring meaning you can keep them with you at all times. As if we weren’t sold already, the company has also recently launched a new candy pink device in order to support Breast Cancer Awareness month. The ZOMM Wireless Leash in pink is available from ZOMM for £69.95 and 10% from each sale will be donated to The Breast Cancer Research Foundation. 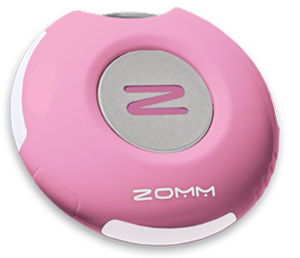 ZOMM is the world’s first and only wireless leash, handsfree speakerphone, and panic alarm for your cell phone. Cancer is so terrible ! we must learn to protect ourself ! !